The president says there is no need to panic. 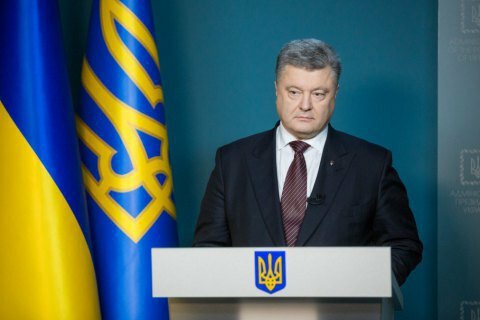 President Petro Poroshenko issued a comment on 19 December in connection with the nationalization of Privatbank. "The state assumes responsibility and guarantees safety and integrity of funds to the clients of PrivatBank. Our decision is based on saving the bank and guaranteeing property rights to financial resources to everyone who put money in this institution," the president said in a statement published on the presidential website. The head of state said the only way to save Privatbank and thus ensure the safety of funds of its clients was the transfer of the bank into state ownership. "Alternative would be irresponsible, for it would mean closing eyes, burying head in the sand waiting for the bank to fall down," said Poroshenko. He said that the former shareholders of Privatbank Ihor Kolomoyskyy and Henadiy Bogolyubov have recognized in letters to the government and the National Bank the need and feasibility of Privatbank's transition to state ownership. He said a team of top specialists was hired to run the bank. The process of forming the group has been joined, inter alia, by the European Bank for Reconstruction and Development. This team, the National Bank, and the Ministry of Finance were tasked to ensure a smooth transition, stable performance and customer service as usual. "First of all, new management must ensure uninterrupted service of socially vulnerable clients. I mean those who live hand-to-mouth, who receive pensions, scholarships, transfer money for treatment etc. But in general, nobody should suffer from the change of ownership. We have made this decision for every client to be protected and avoid problems and for the money to be in greater safety than ever before," said Poroshenko. To increase protection of PrivatBank depositors, the president has submitted an urgent draft law to the Parliament that provides additional deposit insurance guaranties for this institution. "They will be exactly the same as those of Oschadbank, a bank fully owned by the state," said the president. "Dear clients of PrivatBank, please, stay calm. The new administration is taking control already right now, in these hours and minutes. In the current situation, the government has taken the only right decision: to save your funds and increase them in a successful bank. The guarantee of this is our mutual trust and cooperation. Once again, this is our common cause," Poroshenko concluded.